Cambuslang Harriers masters athletes were out in force this weekend as they attempted to defend 3 Scottish and British XC team relay titles, whilst also fielding an M65 team for the first time at the British Masters XC relays at Long Eaton, Nottinghamshire. This was the first time that the club has managed to field an M65 team in any event, with the outcome hard to predict, but the team of Peter Ogden, Barnie Gough and Frank Hurley were keen to lay down a marker for future participation in other events. The lads travelled down on Friday as their race, incorporated within the womens race, started at 12:15pm on Saturday, whilst the M55 team preferred to make a Saturday early morning start to arrive in Nottinghamshire before their 1:45pm start. Peter Ogden was out on the first leg of the 3k lap and battled hard against the wind in the 2nd half of the race to finish in just over 15 minutes to hand over to Barnie Gough in 10thplace. 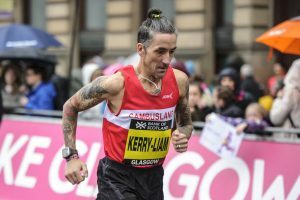 Whilst taking one place, but more importantly closing the gap on a number of other teams, Barnie finished in 13:41 to hand over to Scottish masters internationalist Frank Hurley in 9th place. 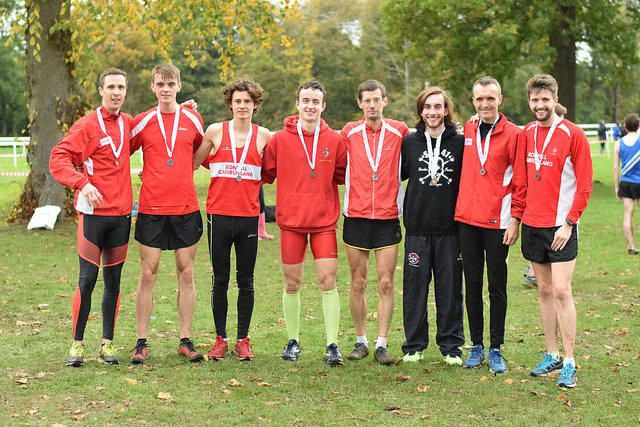 Whilst last years’ winners Blackheath & Bromley and Rotherham Harriers were battling it out for gold and silver, bronze medal position was over 2 minutes ahead, surely too big a gap to close. After a steady start, Frank picked up on the flat, mainly firm, underfoot course and set about passing athletes at regular intervals and with this momentum he hauled in and moved into the bronze medal position well within the last kilometre to secure bronze medals for the team. This was a great effort by all three athletes, with Frank deservedly picking up the award for the fastest time of the day in 12:05. The achievement was all the more remarkable as all 3 athletes have battled injury problems this year. It was also great to see Anglo Jacqueline Etherington running for her English club Sunderland Harriers and finishing in 2nd place on the 1st leg in the W35 age group, with her club eventually picking up the bronze medals, and Jacqueline recording the 4th fastest time of the day in 11:46. 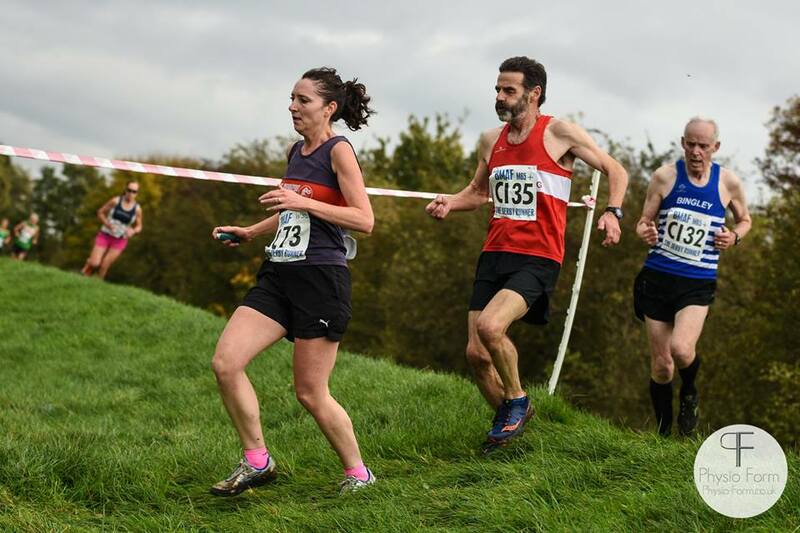 The M35/45/55 race started at 1:45pm with reigning British road race champions South London Harriers fielding another impressive M55 team over the cross country course, and indeed they dominated throughout to claim gold easily over the 4-stage race. 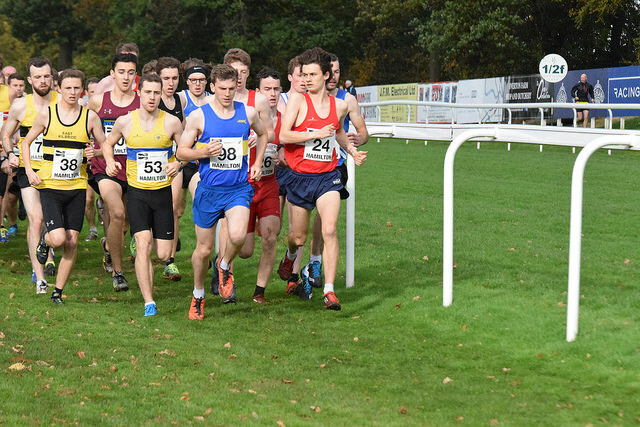 Competition was also expected from Dulwich, Sheffield RC, and Warrington AC as Cambuslang battled to medal once again. Colin Feechan was out on leg 1 and came in on 6th position with a time of 11:58. 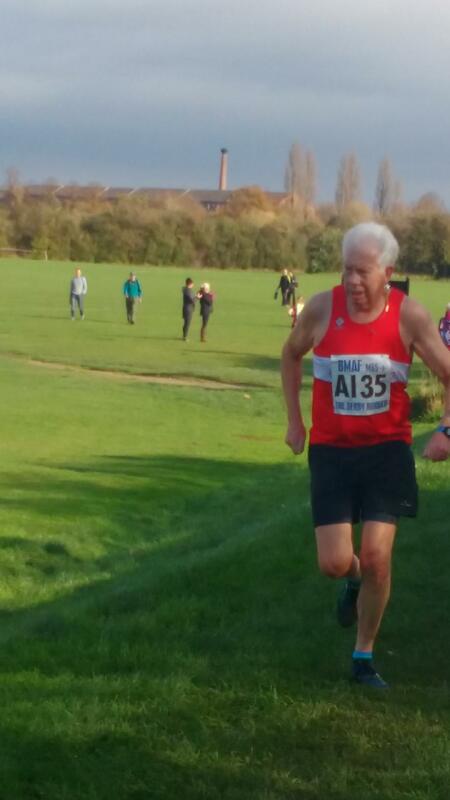 Dave Thom took over and returned in 5th position, whilst also closing the gap on Sheffield on 4th place as he recorded 11:43, whilst South London, Dulwich and Warrington were in the medal positions. Alick Walkinshaw on leg 3, whilst recording the 5th fastest time of the day, put us in to the medal positions for the first time as he came home in 2nd place with a time of 11:08. Colin Donnelly was somewhat isolated on the last leg with victors South London well out of sight, but Colin still ran a great race to record the 2nd fastest time of the day in 10:46 to bring the team home to clinch the silver medals, well ahead of Warrington AC who clinched the bronze medal positions with a spirited run from Dave Norman. Credit must once again go to all involved in the organisation and marshalling of this event which once again went off on the day without a hitch. 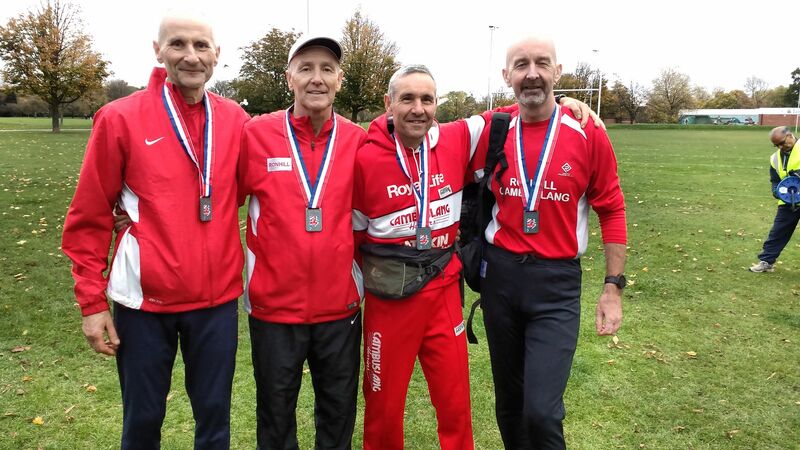 Meanwhile over at Cumbernauld our over 40's mens quartet of Brian Douglas, Robert Gilroy, Justin Carter and club captain Iain Reid narrowly failed to retain their masters title, with Corstorphine AC finishing a few seconds ahead. 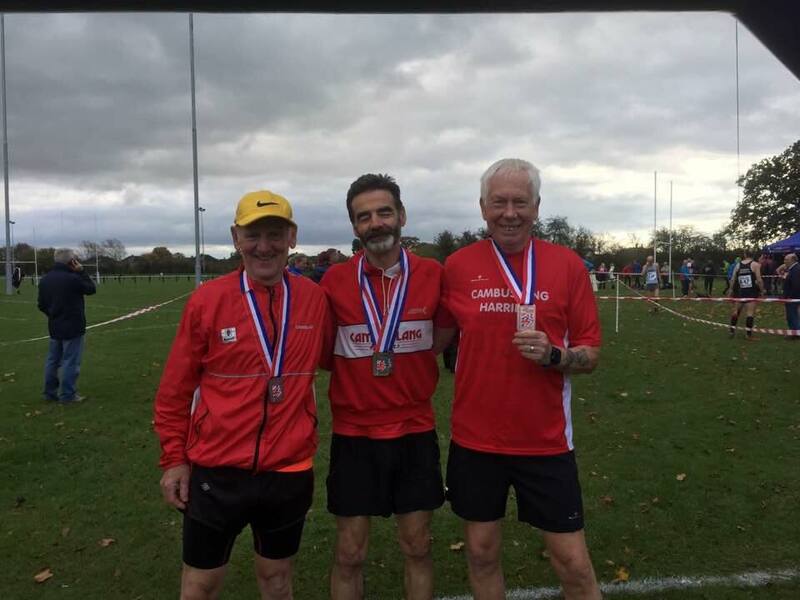 With Stan MacKenzie failing to overcome his recent injury, our over 50's team of Des Dickson, Chris Upson and Dan O'Connell made a valiant attempt at retaining the over 50's title, but just missed out on a podium position as Chris recorded the 2nd fastest M50 time of the day. On a less encouraging note however, the clash of dates for the BMAF and Scottish XC relays only served to highlight the lack of consideration for masters athletes events co-ordination and age group consolidation within Scottish and British Masters Athletics, with any future changes to avoid date clashes also extremely unlikely as our club is the only Scottish club who regularly plans and travels for these British Masters team events. 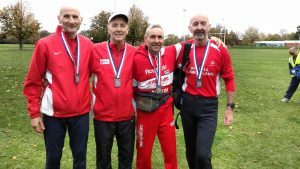 Whilst the BMAF events cater for over 35/45/55/65’s teams, Scottish Athletics support over 40/50’s team races. 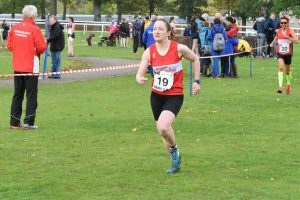 This disparity in age groups will be no more evident in early 2018 when the Scottish Masters XC champs at Kilmarnock in February will issue medals for over 40’s and over 50’s teams, whilst 1 month later in Forres at the BMAF XC champs the team medals will be issued to over 35’s, 45’s, 55’s and 65’s teams. Despite the lack of consistency, we will continue to be represented at both events. 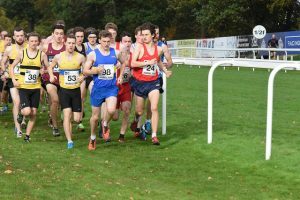 Hamilton Park Race Course was the venue once again for the West District Cross Country Relay Championships on Sunday 15th October. 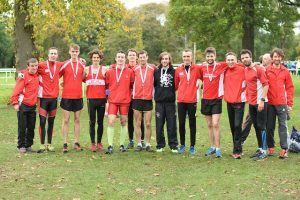 While the young girls and boys teams were missing some runners due to it being the start of the October holiday week and the ladies were also without a few on account of holidays and injuries the men managed to field most of their distance squad. 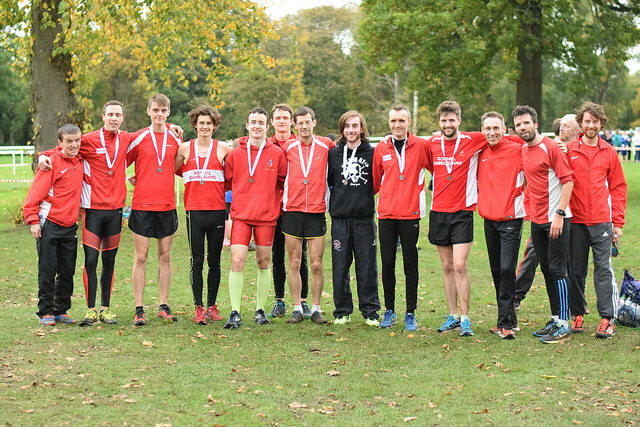 Cambuslang Harriers’ 8 male teams made their presence strongly felt by finishing 2nd, 3rd, 7th, 12th and also 1st Masters’ team over 40, 14th, 36th, 38th and 58th from 79 completed teams. 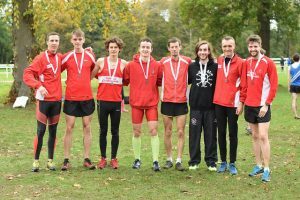 The under 20 and senior quartet of Gavin Smith, Stuart Gibson, Ben Hukins and Craig Jardine were pipped by 10 seconds for the gold medal by a well balanced and inspired East Kilbride team. 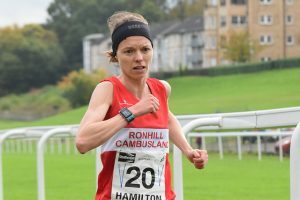 Cambuslang had led from the start but were overtaken in the last half mile for pole position. However, Under 20 Gavin had the consolation of recording the fastest time of the day when coming home first on the opening 4K leg. Throughout the 4 stages the B and C teams had their own close private tussle which in the end saw the C team of Struan Paton, Bobby Bristow, Alistair Campbell and Kyle McLellan take bronze medals while the B quartet of Jamie MacKinnon, Kevan Harvey, David Savage and Colin Reilly finished a worthy 7th. Not surprisingly the M40 team with Robert Gilroy and Iain Reid recording the 2 fastest times of the day and supported by Paul Kernohan and Justin Carter took the masters gold award and also 12th position overall. Not far behind in 14th spot came Ritchie Carr, Fraser Stewart, Matthew McKenna and Andrew Anderson. 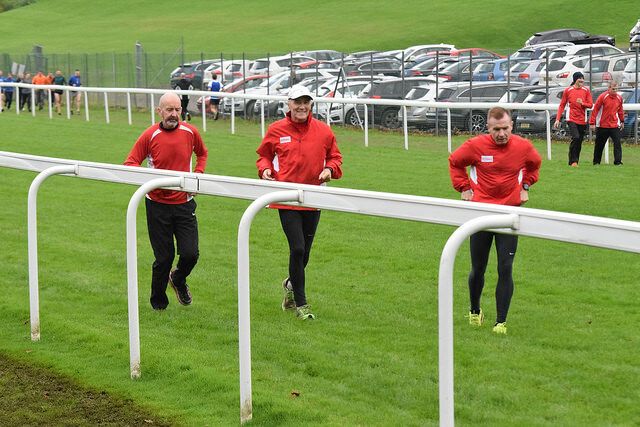 Two further Masters’ teams composed of Des Dickson, Iain Nicholl, Scott Hunter and Mick O’Hagan and the O50 squad of Dan O’Connell, Alick Walkinshaw, Dave Thom and Colin Feechan finished 36th and 38th respectively. 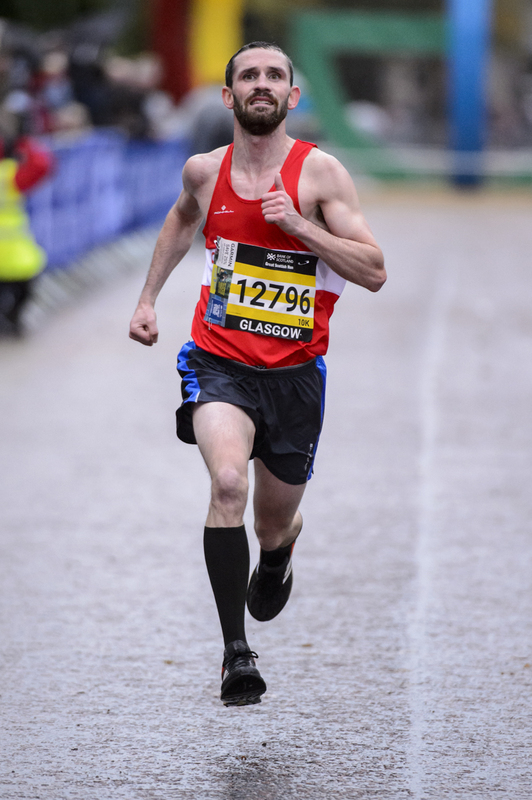 Thomas McDonald, Scott Sommerville, Kenny Finlayson and David Scott completed the Cambuslang teams in 58th position. The Masters’ ladies trio of Claire Mennie, Erica Christie and Jennifer Reid narrowly missed out on the bronze medals. Both Erica and Jennifer were gradually clawing back the deficit on 3rd place Garscube Harriers but in the end ran out of ground. Their overall position was 20th from 58 completed teams. Jennifer was rewarded with the 2nd fastest time in the F45 category and Erica was the fastest F 60. Not far behind in 26th position came Paula McAbe, Lesley McArdle and Lynn Angley. 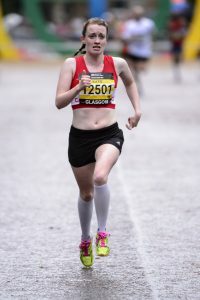 The running formation for the young female and male athletes was 3 legs of 2.5K for an under 13 runner, followed by an under 15 or another under 13 and finishing with an under 17 or 15 athlete. U13 Abbie McClue ran a storming opening leg to come home in 3rd place. U13 Millie Nicholl on leg 2 although competing against older opponents kept the club in 6th spot with U15 Niamh Riggins, one of the youngest on the final stint, anchored Cambuslang to a very creditable 8th position. An incomplete team of Eilidh Kennedy and Shona Carey was well placed after 2 legs and Mia Fagan and Chloe Burton also ran. Unfortunately the young boys’ event ended in confusion for Cambuslang. 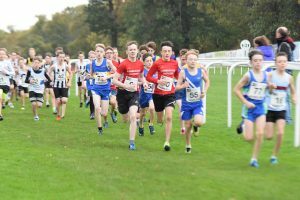 The A team of Lewis Roddis, Brodie Aitken and Drew Pollock were disqualified as Brodie was unable to complete his leg due to injury. Although Drew ran the final lap and his unofficial time was the fastest of the day, it does not officially count on account of the team disqualification. The trio of Michael Byrne, Robbie Woods and Andrew Carey were caught up in the proceedings and were also disqualified. However, Fearghus MacGregor, Michael Black and Ryan Stephen came home in 15th place and one position ahead of Steward Millard, Sean Friel and Keir Crawford from 52 completed teams. 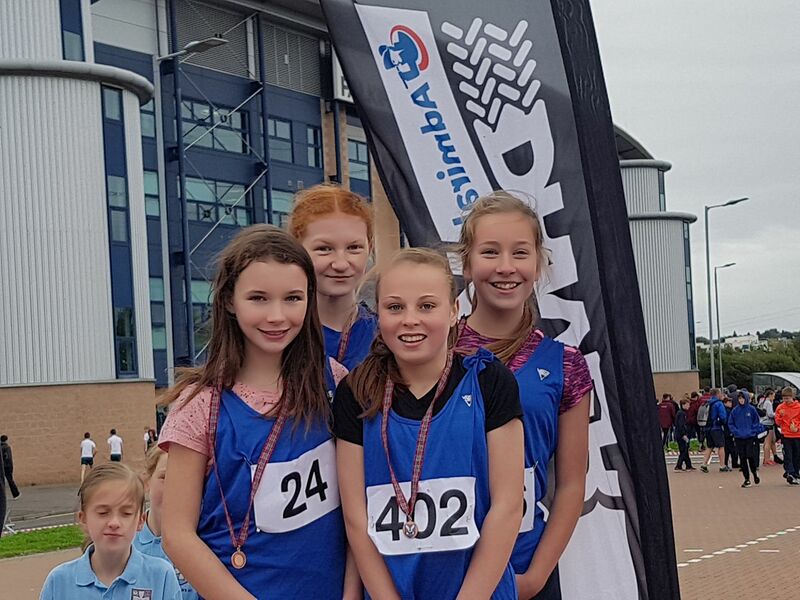 Cambuslang Harriers would like to thank Motherwell AC and the West District Committee for organising the event and the clubs’ coaches, supporters and parents for the help and encouragement given on the day. Many thanks also to Barnie Gough for his input and to Colin Stephen, our ubiquitous photographer. 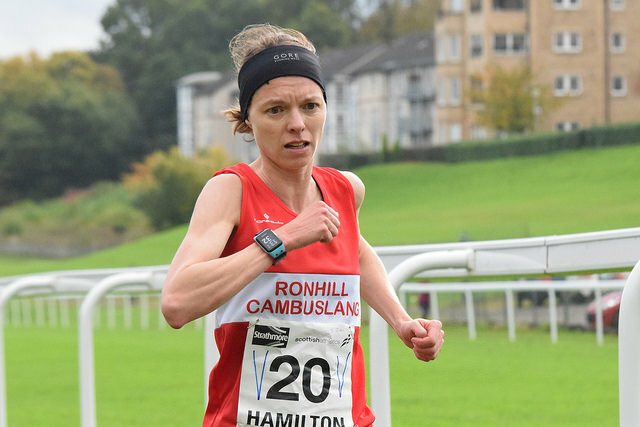 The Scottish Half Marathon Championships which was incorporated into the Great Scottish Run on Sunday 1st October was a medal rewarding day for the club and its athletes. Cambuslang took team silver thanks to the sterling efforts of the O40 masters trio of Robert Gilroy, Kerry-Liam Wilson and club captain Iain Reid. There was a further bonus for Robert and Kerry-Liam when they were awarded gold and bronze for the O40 men category. 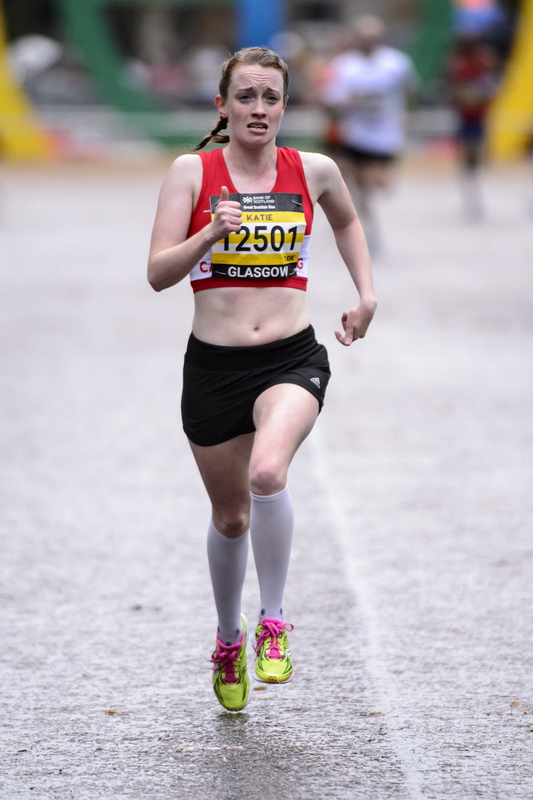 Jennifer Reid made sure that the ladies were not overlooked by capturing the 040 ladies bronze medal with a personal best time thus adding spice to her achievement. Among the 14 finishers from the club Colin Reilly, Justin Carter and John Paul Murphy also set pbs. 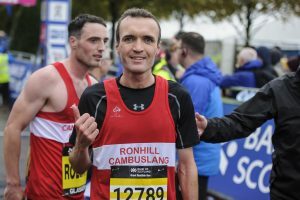 On the same day but in a different half marathon at Carlisle Alasdair Campbell took 5 minutes off his pb to finish second. 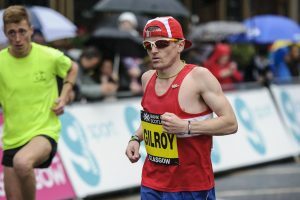 A 10K race was held in conjunction with the Glasgow Half Marathon and Stuart Gibson had a brilliant run to come home first with Doug Roberts on his debut crossing the line in third place. However, due to a registration mix up he was disqualified. While this was unfortunate for Doug he has put down a marker for the upcoming cross country season. David Savage in fourth spot was agonisingly 1 second off his pb and just short of breaking the 33.00 minute barrier while 10th placed Bobby Bristow returned to open competitive racing. 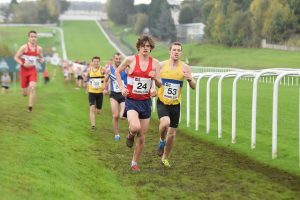 Over 60 runner Frankie Barton recorded an excellent time of 38.16 and under 17 Andrew Carey in his first 10K dipped under 40 minutes. Like her brother Bobby Katie Bristow continued her come back from injury to finish 9th lady. 15 Cambuslang Harriers completed the course. However, a number of our members not competing were out on the course to cheer on our runners and their support was greatly appreciated by our athletes. Indeed top ranked UK O60 ladies marathon runner Erica Christie was seen all over the course offering encouragement. On Wednesday 4th October a number of the club’s younger athletes competed for Cathkin High School in the Scottish Schools Secondary Road Championships. Pride of place went to Drew Pollock who continued his rich vein of form to win gold in the 5/6th year boys’ category. The S1 girls excelled themselves to take team bronze thanks to the combined efforts of Eva Ritchie, Abbie McClue, Eilidh Kennedy and Morvern Crawford. S1 Boy Fearghus MacGregor and S2 Girl Millie Nicholl were well placed in their respective events.